As technologies develop, media diversifies its platforms and products, and becomes more and more present and involved in our lives, building barthesian myths around every object surrounding us, which consequently turns our every act: production, purchasing, consumption, etc., into a cultural experience. But the changes that media has been undergoing due to the development of new technologies, have turned not only the media practitioners but also the media consumers into creators of culture. This phenomena, called convergence culture is one of the main factors of change in the nature and practice of media today, that shape the analysis that Mark Deuze, Assistant Professor of Telecommunications at Indiana University and Professor of Journalism and New Media at Leiden University, presents in the book Media Work. The main focus of the book is the media practitioner and how his work and life style are being changed by new social, cultural, economical and technological developments, that give birth to new paradigms, such as convergence culture (Henry Jenkins) or liquid life (Zygmunt Bauman), which Deuze uses in order to explain the changing nature of media work. The media work is described as a very complex reality, a mix of sometimes contradictory elements that need to work towards convergence: “content, connectivity, creativity and commerce” (Deuze). The collapse of the power system determined by the dissolving distinction between the traditional well established roles and relations between producer and audience, which characterizes the convergence media culture, as well as the consequences of this new pattern of behavior on individual life, which results in a convergence of all aspects of existence, enumerated by Deuze as: “work (production), life (consumption) and play”, determines some of the current features of working in the media. Thanks to this mirror of the media work, that Deuze’s analysis creates, the book is a useful guide for anyone interested in working in the media, for example, for media students that want to know what to expect and what is expected from them as media practitioners, and for media professionals who want to have a critical view on their work environment, in order to better understand and adapt to the changes that the industry is going through. The main question that this book answers: What does working in the media really mean and how does it look like to work in the media?, receives a comprehensive yet rather discouraging answer. The insecurity, fragmentation, precariousness, exploitation, especially in the case of new comers, that characterizes working in the media these days, due partly to the globalization of production and outsourcing, is far from the dreams, expectations and enthusiasm with which media students prepare to enter the industry. What makes the book very actual and practical is that the data sources for Deuze’s analysis are from within the industry: practitioners’ blogs, publications, interviews with media professionals from various parts of the world: Finland, the Netherlands, New Zealand, South Africa and the United States, from four key fields of the creative industry: advertising (including public relations and marketing communication), journalism, film and television production, and game design and development. The book is divided in eight chapters, starting with an overview of the main theoretical paradigms, such as convergence culture and liquid modernity, and the macro-factors: social, technological, cultural, etc., that influence life and work styles in the media industry nowadays, and continuing in separate chapters with an analysis of the institutional, technological, organizational and cultural aspects that determine the work style of professionals engaged in creative industries, in the four main fields mentioned above. Leaving aside the differences that may come from the different products, missions, audiences, technological tools, locations, etc., the media practitioners involved in all these fields seem to be facing nowadays the same challenges that result from the convergence culture. The media practitioners seem to find it difficult today to define their audience and preserve it, as the audience empowered by technology switched from the status of passive receiver towards active producer of media content. Each discipline and practitioner seems to find their own ways to cope with it, and the ones most willing to let go of power and control, both as far as content and the used medium are concerned, and to actively share the creative power with their audience in what is called participative media, seem to have most to win from the current situation, in Deuze’s opinion. This tendency can be most noticed in the game design and development industry. Deuze does a good job at describing today’s media reality and the new work style pattern, which promotes flexibility, project-based work, multi-skilling, soft-skills, rotational work style, informal networking, in various proportions according to the industry, in what seems to be a transition period from the clearly defined unequal relations of power from the time of traditional mass media, towards the convergence media culture and the new power relations, that are in course of negotiation today. He leaves the picture a bit blurry though, as far as future tendencies are concerned. Is today’s insecurity and fragmentation the new media reality or just a transitory stage towards a new reality? Where will the current negotiation of power between creator and audience lead? Will we still be able to distinguish between the two categories in the near future? We hope the author will share more of his visions in a future book. 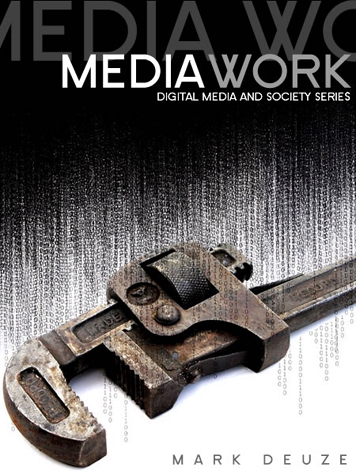 Media Work was first published by Polity Press in 2007, as part of the Digital Media and Society Series and is available for purchase on amazon.com.